This article is about the promontory near Dublin. For river in Cambridgeshire, see Forty Foot Drain. For the Canadian band and their debut album, see Forty Foot Echo. The Forty Foot is a promontory on the southern tip of Dublin Bay at Sandycove, County Dublin, Ireland, from which people have been swimming in the Irish Sea all year round for some 250 years. In former times it was exclusively a gentlemen's bathing place and the gentlemen's swimming club was established to help conserve the area. Owing to its relative isolation and gender-specific nature it became a popular spot for nudists, but in the 1970s, during the women's liberation movement, a group of female equal-rights activists plunged into the waters and now it is also open to women and children. The gentlemen's swimming club still exists and is open to both genders, it expects voluntary contributions to the upkeep of the area. Many people believe that swimming in the extremely cold water is healthy. There is no definite explanation for the origin of the name. 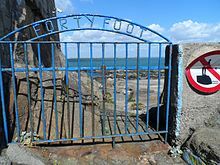 It has been speculated that it may have been called the Forty Foot after the 42nd Highland Regiment of Foot (now known as the Black Watch), a regiment of the British Army, which is said to have been stationed here. Other suggestions forwarded include the depth of the water (actually less than 40 feet), the width of the road leading to the bathing place, while others still suggest it may be related to the amount of fun you have out there.. as in "this much fun". Another recent explanation of the etymology of the Forty Foot, is that many times people would converge upon the bathing place in groups of approximately 20 people, (or 40 feet). But the most likely explanation is that it referred to the near by "Martello" Tower. "Martello" towers were built to a general height of forty feet. (See Wikipedia - Martello Tower) To distinguish the various bathing spots around the area from each other they would usually have been identified with a local landmark. Another well known landmark is the former home of the singer Bono. It is a Martello tower overlooking the coast in Bray County Wicklow. The road from Bray's main street leading on to this tower(Seapoint Road),in olden days was called the 'Forty foot' road by locals. James Joyce and Oliver St. John Gogarty once resided at the Martello tower together. It is now the James Joyce Tower and Museum. The opening section of Joyce's Ulysses is set here, with the characters Stephen Dedalus and Buck Mulligan being partly based on Joyce himself and Gogarty, respectively. Buck Mulligan described the sea as "The snotgreen sea. The scrotumtightening sea." The Forty Foot also featured in the novels At Swim-Two-Birds by Flann O'Brien (1939) and At Swim, Two Boys by Jamie O'Neill (2001). This page was last edited on 30 March 2019, at 20:10 (UTC).